The precipitation amount in May was slightly above-average and the temperature slightly substandard. Extraordinary daily temperatures were measured from 27th May till the end of May. During the month of May the numerous storms and sporadically hail occured. 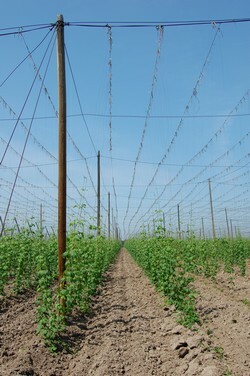 In May hop training was finished at all the areas and the hilling up began. The weather was kindly for hop growing. At the end of May the hop average high reached 2-3 m, uniquely even more. The Downy Mildew of hops occurred and hard aphides invasion appeared practically at all the hop-gardens area. Therefore the chemical treatment was started. The enclosed photo shows the typical hop-garden phase at the end of May.